Stack size plays a very important role in the game of no limit Texas Hold'em. At any point during the game there is the possibility that all of your chips can be put on the line, so it is important that your are not only aware of your own stack size, but the size of your opponents' stacks also. The amount of chips in front of you and the amount in front of the players around you influence a number of aspects of play in Texas Hold'em, ranging from the psychological to the mathematical. This article aims to address the key points that you should remember with regards to understanding stack sizes in poker. Small: 40 big blinds or less. Medium: 41 – 90 big blinds. Big: 91 big blinds or more. Deep: 200 big blinds or more. A diagram to show the general difference between small, medium, big and deep-sized stacks in NL Hold'em. Most online and live poker rooms have limits on how much or how little you can bring to the table from the start. There is typically a 10BB minimum and a 100BB maximum for the majority of limits. 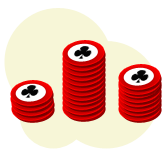 This means that players have the option of buying in as a small, medium or big stack from the off. As you can see there is also a "deep stack" condition if you have 200 big blinds or more. This is common in cash games if a player has bought in for the maximum amount (usually 100BBs) and has either doubled up through an all-in confrontation against another player of equal stack size, or has managed to grind there way up into the realm of the "deep stack". How stack sizes affect the way you play. The size of your stack in poker affects the way that you actually play your cards. If you have a short stack then it will be difficult or impossible to make elaborate bluffs or plays because of the simple fact that you don't have enough chips to scare opponents away from their hands. On the other hand, if you have a large amount of chips in front of you then it is possible to make more advanced plays because you have more chips to work with to manipulate your opponent into thinking that you have a better hand than them. Therefore it is more advantageous to play simple ABC poker with short stacks: betting your strong hands and folding your weak hands. If you are short stacked, you want to play big cards that have the best chances of winning in an all-in situation early on in the hand. The effect of stack sizes on implied odds. Another important fact of stack sizes is the implied odds (and potential reverse implied odds) that are made available by having a big stack. If you and your opponent have a big stack, then your implied odds increase when you have drawing hands. For example if you know that your opponent raises 3.5BBs with AA and will be prepared to go all in on the flop with an overpair, it makes it a profitable decision to call with a hand like 78 because of the amount you can expect to win when you hit the flop hard. It is for the same reason why it is profitable to call raises with small pocket pairs to try and hit a set, even though the chance of hitting a set is usually far less than the odds you are getting. So if you are up against big stacks it can be profitable to open up your starting hand requirements to include suited connectors and so on, whereas if you are up against short stacks you should stick with the big starting hands. Psychological aspects are also involved with stack sizes in poker. If you have a big stack and you are up against an opponent with an equally big stack, then there is the possibility that you could lose all your chips in this one particular hand. Alternatively, if you are up against an opponent that has a small stack, it is not possible for you to lose more than the amount your opponent has in front of them. This means that players will have a greater concern when playing against big stacks than when playing against small stacks. Poker players are more wary about how they play their hand when up against an equally big stack. Lets say there is a raise from player A in late position and player B with Q J calls on the button, everyone else folds. There are now two players going to a flop and they both have big stacks of around 100BBs each, and player A's hand is unknown. The flop comes 2 J 7 , giving player B top pair. Player A is first to act and bets the size of the pot. This actually puts player B in a difficult situation because even though they hold top pair with a decent kicker, player A is showing a lot of strength. Player B decides to call because a re-raise will commit a large number of chips into the pot with only top pair. The turn comes 5 , which probably did not help either player. Player A bets the size of the pot again, and player B quickly decides to fold because they are not prepared to commit so much money into the hand with a hand like top pair. Player A in this example may have had a better hand or he may have been totally bluffing, but it is not the focus of this example. In this hand player A was showing a lot of strength and forcing player B to make difficult decisions. These decisions were made even more difficult due to the fact that player A was making it aware that they were willing to put a large amount of chips on the line in this hand. Therefore player B made the decision to fold the hand because there was too much of a risk of putting a big number of their chips into the pot with a marginal holding like top pair. However, if player A only had 20BBs or 30BBs, then it is more likely that player A would have called the raises or moved player A all-in because there are less chips at stake. The point being made from this example is that it is easier to get big stacks off marginal hands because the prospect of having to call large bets and put more money on the line influences the way that an opponent will play their hand. The bigger your stack, the less likely it is for an opponent to put up a fight with a marginal hand like top pair. This is especially true if you continue to bet strongly on the turn after betting the flop. Poker stack size strategy evaluation. Get a feel for the numbers on the table with a quick scan of the stack sizes (including their positions) as soon as you sit down at the table. It helps. It is fair to say that a large number of poker players do not factor in stack sizes (more specifically, effective stack sizes) when making decisions at the poker table. You should always try and consider the future implications of any hand depending on the size of your stack and the size of your opponents stack. Ask yourself if you really want to get into a big pot with a marginal holding against another big stack. You should also consider whether it's worth calling the bet on the flop if you are fairly confident that you are going to fold when you opponent bets again on the turn. There are many sub-factors involved in stack sizes that it requires some experience to fully understand the implications of each situation. It takes practice to get to grips with it, so get out there and play some hands! Tip: To get good with stack sizes, experiment by playing tournaments (SNGs and MTTs) and cash games that are either short (40bb) or deep stacked (200bb). Don't limit yourself to 100bb poker. Develop your ability to play optimally versus a variety of stack sizes.